The Hotel San Marco is in Venice's most popular location, just off St. Mark's Square. Located in the heart of the city, the San Marco Hotel is therefore the ideal starting point to discover all the secrets of the "Serenissima", from the cultural sites (Doge's Palace, Sospiri's Bridge, Rialto Bridge, Ca' D'oro, Grassi Palace and many others) to the wonderful islands of Murano, Burano and Torcello (made worldwide famous by their craftsmanship). The San Marco Hotel will always welcome its Guests in a comfortable and nice atmosphere. The courtesy of its Staff will ensure a careful and constant assistance. From Marco Polo airport, you can take a public boat, provided by ALILAGUNA Company, which leaves to San Marco every hour. The trip takes an hour and costs 9.81 Euros per person. You can also take a private water taxi to Rio San Moisè for 77.50 Euros (rate includes two passengers with luggages). 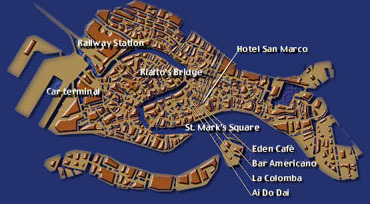 To get to Hotel San Marco from Venezia S. Lucia train station, you can take the public boat marked n° 82 . The price is 3.10 Euros per person. The closest stop is "San Marco".